It was during my first Tiger Safari in January 1990 that I saw a Tigress with 4 cubs and then germinated the thought of making the world aware of such a majestic predator. I was working with the Taj Group of Hotels at that point, and to be sure that my love at first sight with Tigers was not a one night stand, I did many safaris over next few years. The love only grew, rather encompassed my body, mind and soul to an extent that I was convinced that Tiger had to be saved. It is too precious a creation of the almighty for us to let it slip through our fingers. But how do we do it. Though there was government working towards it, but challenges of the developing nation are far too many for the Tiger to get priority in eyes of the government. So I decided in my small way to make the world aware of the Tiger. India is one country where people can come and see the Tiger in the wild. The difference in seeing a Tiger in the zoo and a national park is beyond comparison and comprehension. A two minutes Tiger sighting in a national park can change the course of one’s life, it certainly did mine, and many more whom I know in last 27 years. When one goes to see a Tiger in the wild in some national park, we indirectly saves the Tiger. Question is how? Simple when you stay in a lodge in some national park, you are paying for your stay, a part of that money is getting circulated in the local community. The Resorts are employing the local staff thus generating employment, and conserving the community which in turn conserves the forests. Then when you go and do a safari in a vehicle, that vehicle is owned perhaps by another local entrepreur, the forest guide going with you is the sole bread earning member for his family. Hence a local economy is getting fuelled when you visit a national park. Our carefully chosen lodges (which employ more than 90% staff from local villages) ensure that you have meaningful excursions into the forest. Though Tiger sighting is a matter of chance but our experienced guide and drivers try their best to show you atleast one if not more Tigers during your safaris with us. We specialize in tailor making the Tiger tours with or without any other cultural interests that you may have. Be rest assured of a lifetime of an experience with us at Tiger Safari. Assuring you of our best always. As our commitment to nature conservation and eco-tourism, we fully support and contribute towards the welfare of this endangered species. 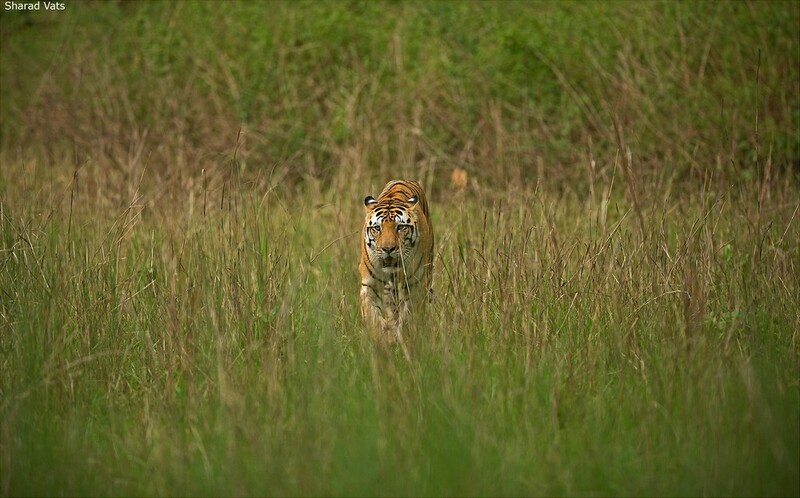 We make all the efforts to save the tiger an its natural habitat. We offer you eco-friendly safari adventures. Together we're changing the world - one journey at a time. Looking for a photographic destination of a lifetime? Well, this is it! This photographic safari will be conducted in Bandhavgarh National Park and Kanha National Park, home to the elusive Royal Bengal Tiger. These two parks are among the world’s most outstanding wildlife destinations, landscape, and cultural location. Tigers occupy the pinnacle of the food chain and a healthy tiger population is an indicator of the well being of the whole forest. Throughout evolution, predators have had a regulatory influence on the population sizes of other species; it is thanks to carnivores, such as tigers, that the number of herbivores is kept in check. Tiger Den Resort Ranthambhor, sprawling over an area of 5 acres on the edge of the Ranthambore National Park, is a place that refreshes your scenic senses. Nestled among the majestic Aravalli Hills, covered with lavish flora and fauna, it provides soothing warmth to the eyes and relaxation to the mind. The God Ayyappa, one of the most popular dieties in Kerala represents an ideal who may be approached by all men, whatever there caste or faith, and before whom all find themselves equal, regardless of their background and status. He is the offspring of the brief union between the beautiful enchantress Mohini and the God Shiva.